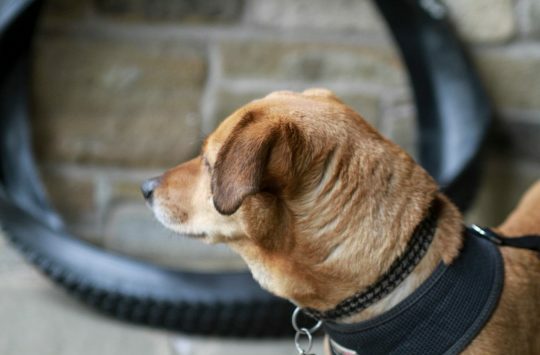 Surfwear brand ION has been around since 2004, but it wasn’t until 2012 before the brand launched into mountain biking. Drawing on its extensive experience of working with neoprene and other technical fabrics, ION has steadily grown its product line over the past five years to include a range of high quality riding apparel that includes jerseys, shorts, protective wear, and now footwear too. After a solid winter of use and abuse, I recently published a review of the brilliant ION Neo waterproof gloves, and Hannah also had great things to say about the ION Collision Softshell Pants that earned a Singletrack Editor’s Choice Award for 2016. Here however, we’re going to take a look at some of ION’s knee pads. Specifically the K_Lite R, which is ION’s most lightweight and pedal-friendly option. If you’re after a burlier knee pad with more protection, ION has no fewer than eight other options in the range, including the K_Pact and the K_Cap. The ION K_Lite R knee pads. “The brand new K_Lite R is based on ION’s lightweight and highly reduced K_Lite. Enhanced climate comfort and improved freedom of movement were the focus of attention during R&D in collaboration with Enduro World Champion Richie Rude: by using a very breathable neoprene called Super Perforator Neoprene the new yet still lightweight knee-pads score highly with reduced heat accumulation underneath the sleeve. As a means of reducing resistance to the pedal movements from the protection pad itself, the K_Lite R is much more flexible: instead of using SAS-TEC foam with a hard cap, the new model carries a pad of HD Memory Foam – a blend of PU and EVA. This results in improved flexibility and meets the requirements of enduro racers looking for lightweight protection that doesn’t affect pedalling” – From ION. Electing for breathability and flexibility, the K_Lite R is the lightest knee pad option from ION. Increased breathability thanks to the open design at the back of the knee. 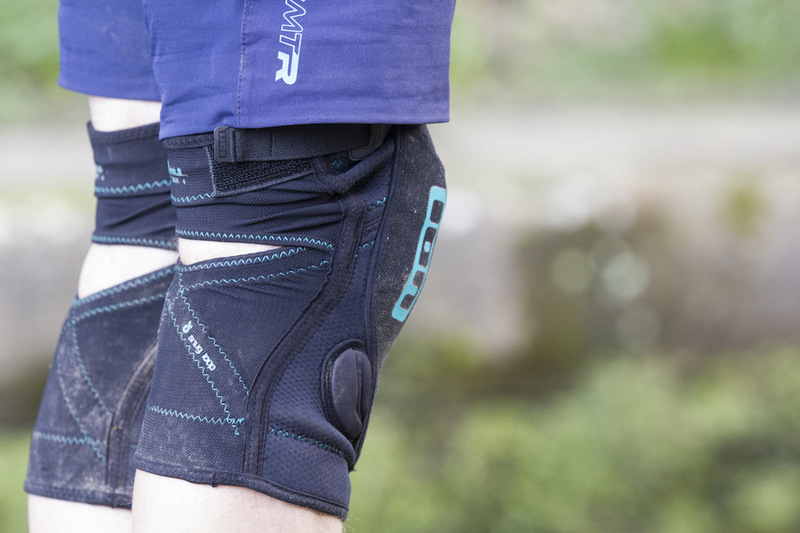 Like almost all the other knee pad options in our Pads For Pedalling group test (the Endura SingleTrack pads being the single exception), the ION K_Lite R pads use a partial sleeve-style style construction that allows them to be slipped straight onto each leg without need to use large velcro straps or such. However, you’ll have to remove your shoes to do so. If that bothers you and you’d prefer a knee pad that you can easily install and remove without having to remove your shoes, then ION makes the K_Lite Zip exactly for that purpose. The ‘Snug Loop’ uses an elasticated ‘X’ across the back of the calf to keep the pads secure. Breathability is the name of the game with the K_Lite R knee pads, and to enhance the pad’s ability to wick away moisture and ventilate the skin underneath, ION has used a combination of perforated neoprene for the front, and mesh panels on the back of the sleeve. An opening around the back of the knee also serves to keep cool air passing over your sweaty legs, while also enhancing comfort through pedalling movements. The discreet Thigh Match velcro cinch strap. To keep the pads in place, ION uses several figure-hugging techniques with the K_Lite R pads. Around the thigh cuff you’ll find an elastic velcro cinch strap that offers discreet adjustment to snug the top of the pads down. The strap secures on the outside of your thigh to eliminate any interference issues with your frame’s top tube during pedalling. Lining the inside of both the top and bottom cuffs is a thick band of silicone gripping detail that gives the pads a little more ‘stick’ on your skin. 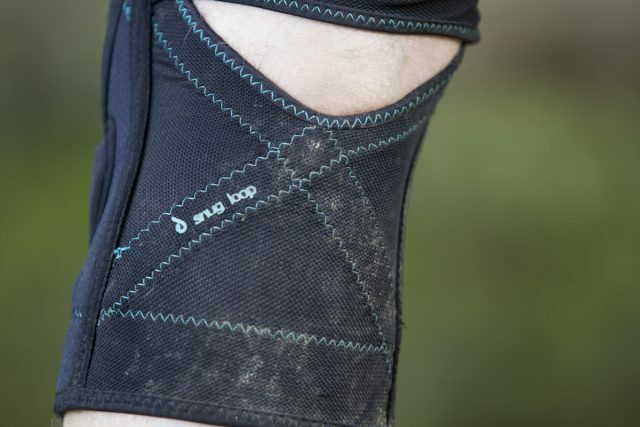 In addition to this, an internal rubberised panel sits between the mesh sleeve and the top of your knee cap for further security, while the backside of the pads uses an elasticated ‘X’ formation across the lower portion of the mesh sleeve (ION calls this the ‘Snug Loop’). A high density soft memory foam pad is used for protecting the rider’s knee. ION traditionally makes use of a third party protective material for most of its knee pads, which is called SAS-TEC. You’ll find the same material used in other brands protective wear products, which includes spine protectors in backpacks. For the K_Lite R knee pads however, ION has elected for a high density memory foam pad instead. The reason for this move was to increase overall flexibility and breathability compared to the hard cap used on its heavier duty knee pads, with the main goal of the K_Lite R being the ability to wear them all day long on a pedally ride, without feeling the need to constantly remove them for the climbs. 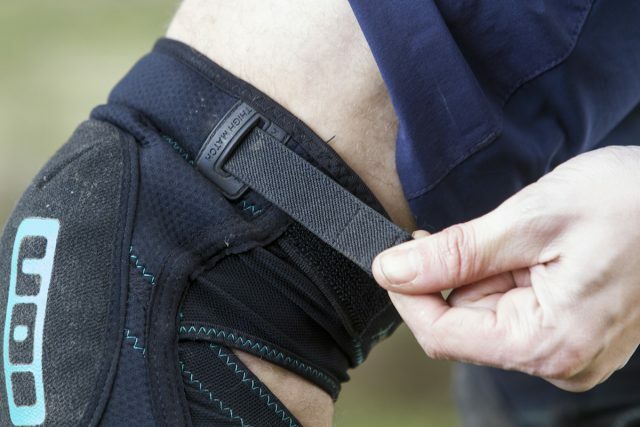 The HD memory foam protective plate has been shaped and articulated to conform around the knee cap, and so it wraps a decent way up and around the face of the knee. As secondary protection to the main HD memory foam pad, ION has also added some thick foam panels on each side of the front of the pad for a little extra cushioning for the shins. The main protective plate extends down the top of the shin, with additional side foam pads offering extra protection. 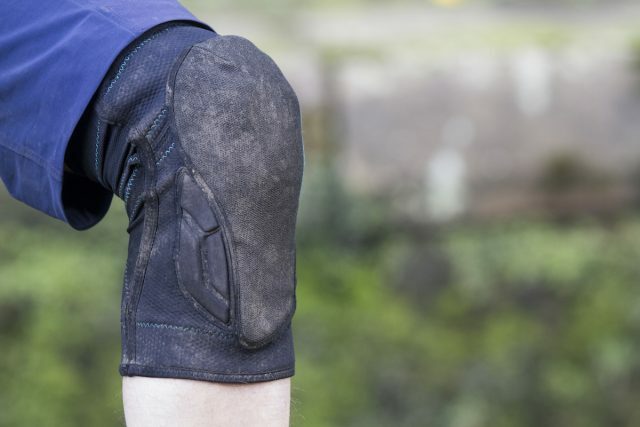 However, unlike the POC VPD Air pads that took out the ‘Best Protection’ title in the Pads For Pedalling group test, the ION K_Lite R knee pads don’t feature a whole lot of protection on each side of the knee itself. To be fair, these are ION’s most lightweight knee pad offering, and the K_Pact delivers significantly more protection for those who want it. 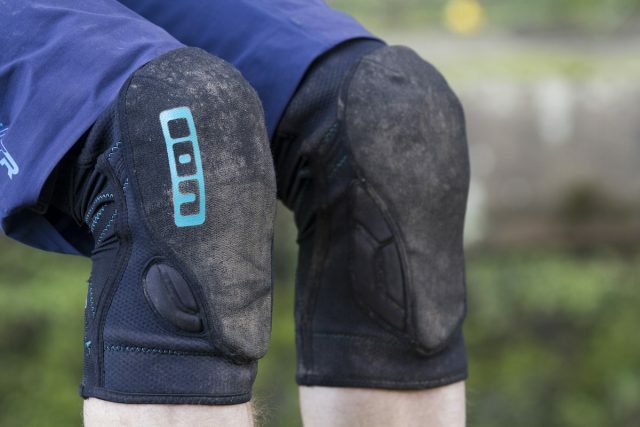 When first slipped on, the K_Lite R knee pads deliver a chunkier and more substantial feel than some of the slimmer knee pads in the group test, such as the G-Form Pro-X pads, which are more like a thick knee warmer really. The main protective panel on the K_Lite R is much larger, and covers a good portion of the knee, with plenty of coverage down the top of the shin too. After setting off on the trail, it doesn’t take too long to stop thinking about the K_Lite R pads. They’re comfortable, and they hug your knees well. The HD memory foam pad bends and twists with ease as you pedal, and the soft neoprene sleeve does a good job of staying put while riding. However, I did find the Thigh Match velcro strap at the top of the pads to be somewhat superfluous – no matter how tight I snugged the strap up, I still found the top cuff would slowly work its way down my thigh, leaving fabric bunching up around the top of the knee pad, causing a little more rubbing as things got hot and sweaty. The rest of the pad didn’t budge, so it was really only a minor comfort issue. A high quality Aramid fibre covers the front of each knee pad. While I would like to see a little more side coverage for the knees, the protective plate on the K_Lite R pads offers a good deal of blunt-impact protection for hitting the dirt with force. And while there’s no hard cap inside, the HD memory foam is also quite proficient at glancing off sharper and more acute jabs from tree branches and rocks. 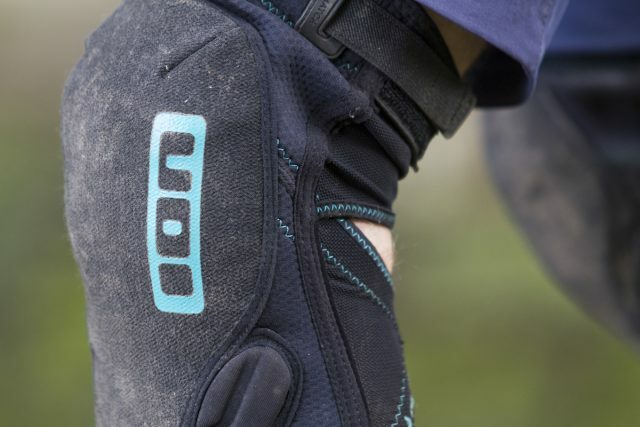 Amongst other options in the group test, the ION pads delivered a similar level of protection to the iXS Hack EVOs, the POC VPD Airs and the Dakine Slayer pads. Just like those aforementioned options, ION seems to have gotten the balance right with the K_Lite R pads between usable trail protection, and pedal-friendly flexibility. 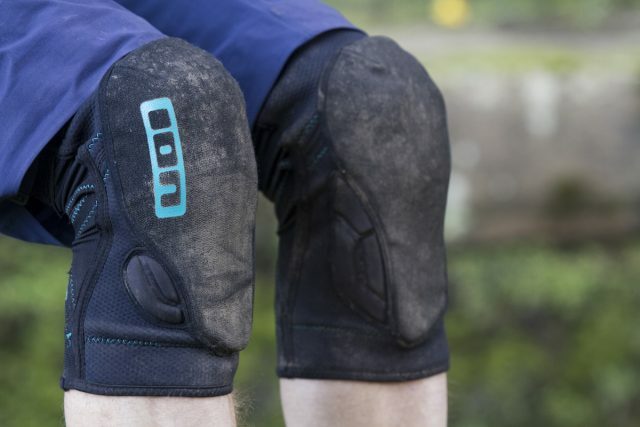 ION has built an excellent set of knee pads in the K_Lite Rs, and I’d have no troubles recommending them to riders who want a set of pads for pedalling, but still need decent armouring. Certainly there’s more genuinely useful protection here than found on some of the token superlight knee pads that are merely glorified knee warmers, and that will make the K_Lite R pads appealing not just to XC riders and beginners, but also hard-hitting trail riders and enduro racers who appreciate flexibility and breathability. If it weren’t for the tendency for the top cuff of the pads to slip down during riding, the K_Lite R pads would have taken out the ‘Best Overall’ title in the Pads For Pedalling group test. However, they’re still very comfortable, and they’re built to a very high standard too. The high quality aramid fabric coating over the top of the knee pad certainly helps here. 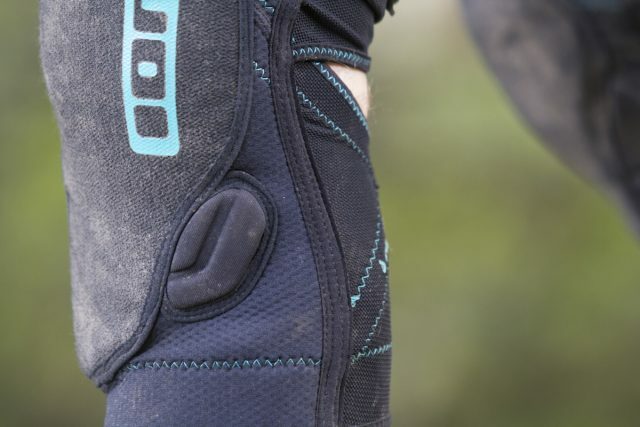 Despite months of winter abuse that’s involved plenty of knee-sliding on the trail and car door-catching off the trail, the K_Lite R pads are still looking in great condition – which is more than can be said for those lighter weight pads in the group test.